Eight limbs of yoga a way to live a healthy life more meaningfully and prosperously. Yoga is an art of living. Regular practicing of yoga is good for health. 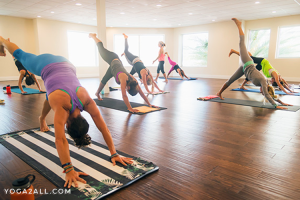 Yoga connects body, mind, and spirit. It helps to maintain balance in the human body and fosters awareness in ourselves. Daily yoga practice helps to live in peace, reduces restlessness in mind, strengthens the body and boosts up immunity system. Yoga had rooted and practiced in India more over thousands of years before and the philosophy of yoga had been written down in The Yoga Sutra of Patanjali. In this age, we are living with lots of stress, tension as well as pressure. A questing is always hunting us, then how to live stress-free and peaceful life? Most of us consult with counselors to solve various problems in life. Many people take sleeping pills or join various communities to find the solution and live in harmony. But, alas! Life remains the same and it is getting tough and unmanageable. Life can be easy and joyous in following simple steps. First of all, you need to maintain discipline and a proper diet. Add up yoga in your daily regime and get uncountable benefits. Daily workout not only good for health but also helps your mind perform in sync with the body. As per holy sage, Patanjali, mind works continuously, consciously or unconsciously; the only way to controlling restlessness of your mind is eight limbs of yoga, which is also called Ashtanga. “Ashta” means eight and “Anga” means limb. Let us have a brief discussion of Eight Limbs or steps of yoga. Yama: it is the first limb and deals with ethics, integrity and it focuses on your behavior as well as how you conduct your life. yamas are known as the Golden Rule. The five yamas are nonviolence (Ahimsa), truthfulness (Satya), nonstealing (Asteya), continence (Brahmacharya), noncovetousness (Aparigraha). Every week choose a yama and apply it in your thought, speech as well as action. Niyama: It is the second limb and deals with self-discipline and spiritual practice. Five niyamas are cleanliness (Saucha), contentment (Samtosa), spiritual refinement (Tapas), a study of sacred sages and you (Svadhyaya), and devotion to all mighty (Isvara pranidhana). Every week, put a new niyama in action and practice it. Asana: the third limb is Asana. Asanas are the yoga poses. Philosophy of yoga says, the body is the temple and it needs proper care to achieve spiritual growth. The practice of asanas reduce tensions, increase concentration power, boost up immunity system as well as develop a sense of discipline. There are several asanas to practice. Practice basic asanas like Dolphin pose, Warrior 2 & Warrior 3 pose, Triangle pose, and sun salute regularly to achieve balance in the body, rest in the brain and boost up your immunity system. Pranayama: It is the fourth limb. It is the technique to learn how to control over breathes and consists of breathing exercises. Choose at least 3 days in a week to practice basic pranayamas like Deep Breathing, Bhramari, Anulaom Vilom, Kapalbhati, and Ujjayi. The process will improve your health in refreshing mind and increase immunity. Pratyahara: It is the fifth limb. It means the withdrawal of five senses and a detachment from the outside world. The practice of this fifth limb takes you back to the core of you. Means you will step back and take look at yourself. Dharana: it is the sixth limb and helps you to concentrate or focus. It is not an easy task. Practicing Dharana, you will learn how to slow down the process of thinking on a particular object with full concentration. Dhyana: it is the seventh limb and is known as the stage of meditation. It is the natural stream of concentration or thought. Samadhi: the final limb is Samadhi. It is a state of ecstasy as well as the supreme state of awareness. At this step, meditator or yogis feel a strong bridge of connection between the supremo (divine) and all living things. Eightfold path or eight limbs of yoga or ashtanga helps you in your personal development and connects your body with mind and soul which leads your life towards enlightening. Although eightfold yogas make you healthier and more energetic. These steps benefit each part of the body and help to increase immunity. It is also seen that these eight steps increase alpha and theta waves in the human brain and provide relaxation. Day by day stress hormone will be decreased in a normal way. These steps increase the power of your brain and increase access to subconscious and emotions. The chemicals, like, endorphins, enkephalins, and serotonin are increased with practicing eight limbs of yoga and you will feel good and your brain will be more relaxed. 8 Limbs of Yoga an eight-step roadmap, by which human being can live in peace and reach an apex of consciousness. These eight limbs generally guide a person how to live meaningfully and purposely.